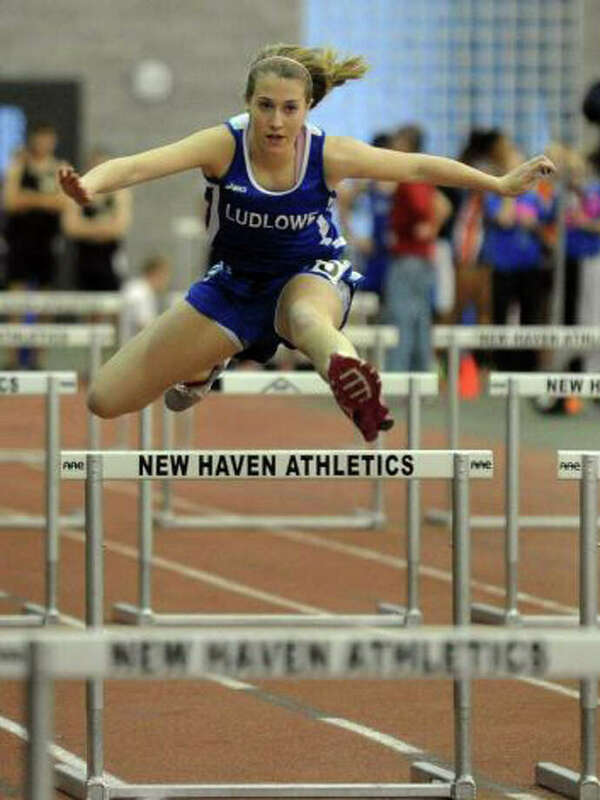 Fairfield Ludlowe sophomore Alex Wykoff will be one of the top-hurdlers for the Falcons in 2011-12. The Fairfield Ludlowe indoor track teams have become one of the best programs in the FCIAC. The boys team has won the league's Central Division each of the last two seasons. The girls team was paced by New England-qualifier from 2010 Heather Moriarty and Sydney Kay and Mary Deliberti each reached the State Open a year ago. On the boys side, despite Tyler Schwarz's departure to Marist, head coach Dave Nulf has a strong group of returners on his side. "We lost many highly competitive seniors," Nulf said. Returning for the Falcons will be senior captains Jack White and Andrew Fernandes. White is a versatile runner who can compete in any event from the 400 to the two-mile. He and Fernandes also make up half the club's 4x800 relay team. John Grant will also be a senior captain for Ludlowe, he's a high-jumper and 3,200 meter runner. "We hope to send a fair number of athletes to compete deep in the postseason," Nulf said. But those three won't be the only seniors to pace the boys. Jordan Filipovich is a sprinter and high jumper. Leo Nolan will compete in the longer sprints. Newcomers Christian Barral, Clint Kacegowicz and James Randolph are all seniors expected to contribute for Dave Nulf's unit. Peter Jacobs will spearhead a talented junior class in the short relays. Jacobs also was a state qualifier in the long jump. Ryan Arrigo and Rob Ficarra are both outdoor track runners who decided to give indoor a try this season. On the girls side, head coach Amanda Parrish will have a much larger coaching staff than she is accustomed to. Matt McCloskey will coach sprinters, Susan Christoffersen will work specifically with jumpers and hurdlers and Nulf will coach the throwers. "It's an exciting opportunity to devote more time to event-specific training than we have in the past," Parrish said. Kay, Moriarty and Deliberti are three of the team's four captains with Marisa Klein rounding out the senior leadership. "All four will likely be contributors in the postseason," Parrish added. Juniors Lizzie Pratt and Glenn Carr return and KC McAuliffe is the school-record holder in the high jump. Alex Wykoff is a sophomore who earned hurdling time as a freshman and qualified for the FCIAC meet. Sara Morris and Lindsay Zilling will also return.